My little girl Fufer passed away on April 4th 2009. Fufer was 21 years old and had an extremely full life. To make a very long story short, we rescued Fufer when she was about 2 years old, she had just given birth to a large litter of puppies and appeared badly abused with a very large wound to her throat, later the vet felt that this was a knife wound...How can someone do such a thing???!!! 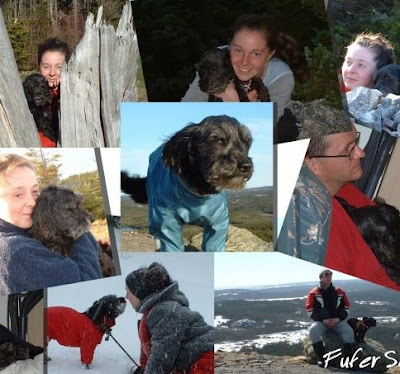 Fufer spent almost every moment of her life by my side, we traveled to many places, stayed in hotels, ate a wide variety of foods, hiked many mountains, wooded paths and roads. On average she liked to walk 6km a day. I can count the number of times in her long life that she did anything bad. She was extremely obedient and very healthy. She learned to swim at the age of 16. At 16 she also became deaf, this lead to a week long ordeal to find her. After that she started to become blind but still had the energy of a puppy and enjoyed romping in the snow with friends. Fufer became senile at the age of 20, and while she still very much enjoyed her meals and short walks in the driveway she was wearing out. On April 4th after a seizure caused her to give up food and water we made the difficult decision to let her go. As hard as it was, fufer gave me so many good times and I enjoyed every minute of her life. We will always love you sweet girl. Always.